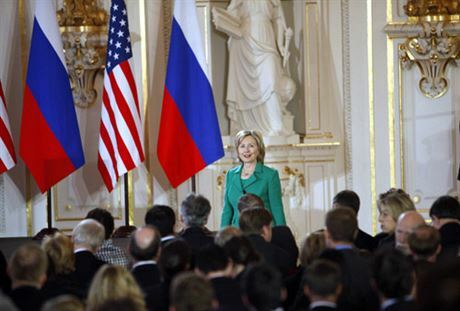 PRAGUE, Czech Republic, May 7 (UPI) — Secretary of State Hillary Clinton has been rather exceptional in her first 100 days in office. She has been a praetorian guard for the American people. She has been a loyal general and quiet hand behind President Obama’s overwhelming public presence. It was mid-Friday, April 3. We had received final notice the secretary’s schedule was full. After brainstorming all day, I had an epiphany. I called John O’Sullivan. A respected former journalist and chief adviser to Margaret Thatcher, he is now Executive Editor of Radio Free Europe/Radio Liberty. He is also an old friend from the fight against communism and a member of Global Panel America’s board. “John,” I said with urgency in my voice, “I need a favor. The Prague Society has not made it onto the secretary’s schedule. I know she is visiting RFE/RL. I need an exception to get me in at this late date to cover her visit.” An hour later, it was done. This was not a simple request. For those who do not know, when a ranking U.S. official visits anywhere overseas, security precautions are overwhelming. Guest lists must be submitted weeks in advance. Guests must be in their places hours before the principal appears. And then comes the lockdown — no one in, no one out. The secretary’s entire European schedule was beyond packed, beyond frenetic. We had been in contact with her staff. We had hoped until the last minute for a pass-by, a sidebar somewhere between meetings. I must say — and I have dealt with many presidential and ministerial staffs — they were polite, helpful and normal. I mean normal. And trust me, that is not a standard occurrence or practice. The secretary’s speech at Radio Free Europe was her only offline visit. She is an ex officio member of the Broadcasting Board of Governors, but it was still tough to fit in a secretary of her stature, especially when 27 heads of state, along with foreign ministers and a slew of other officials, were asking for her time. Never mind the president himself. RFE/RL President Jeffrey Gedmin and his staff fought diligently to get her in the door. I had arrived at 8:20 a.m., just before the lockdown. Bill, the head of RFE security, met me and I asked if we could have a smoker’s moment outside. He was delighted and later led me to the staff dining hall. There were several hundred RFE/RL journalists waiting patiently to be led into the broadcast room to hear Clinton in two hours’ time. I stood with Gordana Knezevic, the head of the South Slavic Service, a Bosnian by birth; her children live and study in the United States. We discussed ethics in general in Central and Eastern Europe and noted that it is at a disturbingly low level among government officials and even home-grown business folks — the top of whom are often the sons and daughters of former apparatchiks and nomenklatura from the days of communism. It makes me sick. John O’Sullivan joined, as did senior correspondent Ron Synovitz, as we engaged in an intense discussion about ethics in Bulgaria and Romania. I had just met a week earlier with Solomon Passy, the former Bulgarian dissident and foreign minister who had been a dark horse candidate for NATO secretary-general. Solomon and I had met in the offices of Zdravko Popov, the competent and affable Bulgarian ambassador to Prague, and spoken about corruption, communists and the future of NATO. He surely would have had a much better chance without Bulgaria’s seriously negative reputation for corruption. It was time. Clinton had arrived. We shuffled into the broadcasting room. After a few minutes, Gedmin introduced Clinton with a clarion call to “smart power and soft power” — something represented by Radio Free Europe. Clinton powered down the front glass stairs to thunderous applause. She was within earshot of me and just a handshake away. She looked around. We made eye contact. She smiled. “We’ll talk,” her lips mouthed silently to me. “My visit sped up your moving process,” she joked as all laughed, reminding those present that Radio Free Europe had moved just a week earlier from its location of the past 16 years in the former Communist Parliament Building at the top of Wenceslas Square to a specifically built new compound. RFE had previously been in Munich and had moved after the fall of communism. Tom Dine, the former head of the American Israel Public Affairs Committee, had been the head of RFE in those transition days. He still is the standard by which RFE presidents are measured. “It has been 12 years since I was last here as first lady.” I had also been present at her visit then. “Smart power takes smart people. It takes reaching out to Iran, Iraq, Afghanistan and the North Caucasus even when risks are involved. … In Afghanistan, Radio Free Afghanistan is the most popular station. Fifty percent of all adults tune in. And with that, a remarkable public servant slipped away.